Austrian archeologist; born Nov. 28, 1850, at Karánsebes, Hungary. He first studied Jewish theology and then philosophy at Vienna and Prague. The Austrian government subsequently sent him to Italy and Greece, where he engaged in archeological investigations, studying especially antique pottery. Klein is professor of archeology at the German University of Prague, and a member of the Gesellschaft zur Förderung Deutscher Wissenschaft, Kunst, und Literatur in Böhmen, as well as of the German Archeological Institute. 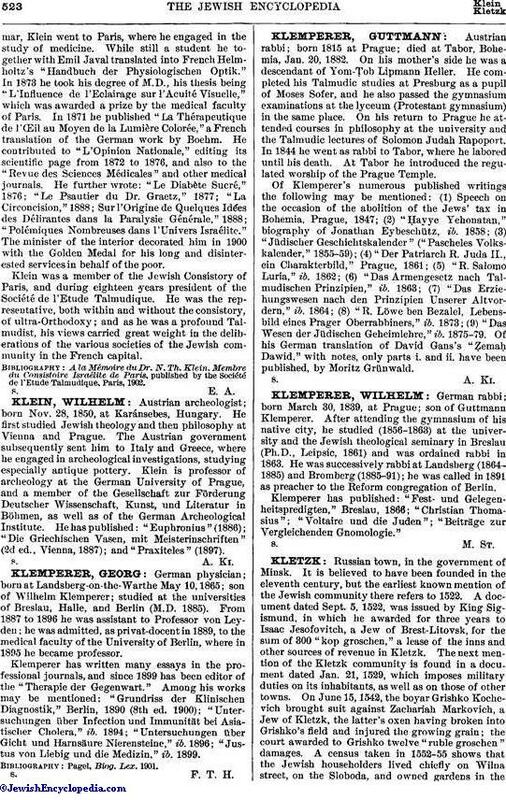 He has published: "Euphronius"(1886); "Die Griechischen Vasen, mit Meisterinschriften" (2d ed., Vienna, 1887); and "Praxiteles" (1897).